CGG announced that all four phases of its BandaSeis 2D BroadSeis multi-client program targeting the Banda Arc around East Indonesia and Timor Leste have now been fully processed and are ready for delivery. They offer important new insights in this prospective frontier area. The regional program, totaling more than 14,000 km of broadband seismic data, was acquired in co-operation with the Indonesian Directorate General of Oil and Gas (Migas) and the Timor Leste National Petroleum Authority (ANP). The data was processed to pre-stack depth migration (PSDM) in four stages in CGG’s Singapore imaging center, with the final phase being delivered at the end of the second quarter of 2015. 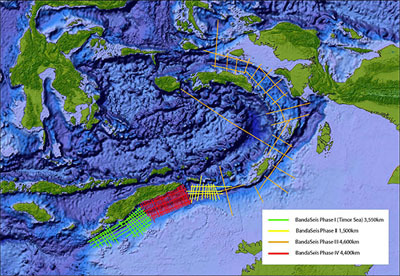 The final seismic images will help explorationists understand the geological development and prospectivity of the Banda Arc, which is located in the active collision zone between the Australian continental plate and the Indonesian island arc system.